Steffan Donal has a microchip embedded in the back of his hand. It’s about the size of a grain of rice. The chip is NFC-enabled, which means he can use his hand to communicate with his phone and other NFC readers, although the range is just a centimeter, given the size of the antenna. (NFC, for near field communications, is widely used for contactless payment and other tasks.) Donal bought it from Dangerous Things, a Seattle-based site featuring products such as magnets and RFID transponder chips and installed it himself by injecting it under his skin. Donal, like most biohackers today, is more enthusiast than transhumanist but he understands the line that has been crossed: one that could ultimately lead to more people taking on technology to improve security and, in the future, potentially supplementary intelligence. For Donal, it’s practical. While he says he’s not shy about experimenting with his body, he wanted to see if he could improve his security and convenience through technology. He says the implant allows him to “securely log into web servers without having to remember lots of complicated passwords.” He is keen to explore more products and upgrades and believes he is typical of the current crop of biohacking enthusiasts. He doesn’t see it as mainstream and there is a sense that he doesn’t want it to be either. He still enjoys the shock factor, confusing the ticket barriers at the London Underground for example, when he places his hand on the reader and causing the system to report an error. Biohackers are not new of course and the definition can vary depending on who you talk to. The likes of Professor Kevin Warwick and Amal Graafstra have pioneered what is now generally referred to as ‘grinders’ – people who modify their bodies with technology implants and cybernetics. At a World Government Summit in Abu Dhabi in late February, the subject came to the fore again as Tesla-founder Elon Musk talked about how humans must merge with machines in the future to avoid becoming obsolete. "Over time I think we will probably see a closer merger of biological intelligence and digital intelligence," Musk told the audience at the launch of Tesla in the United Arab Emirates (UAE). "It's mostly about the bandwidth, the speed of the connection between your brain and the digital version of yourself, particularly output." Futurologists love this stuff. To a large extent, you can say anything about the future and get away with it, so are Musk’s comments far-fetched? Will today’s biohacking evolve into creating the building blocks for the cyborgs of tomorrow? Alex Warren, author of Technoutopia: How optimism ruined the internet, says that Musk’s ideas are short-term and typical of Silicon Valley. The answer to tackling the threat of technology is he believes, not more technology. "With over 15 million jobs at risk from technology in the UK alone, Elon Musk is right to question the future of humanity’s progress and productivity. Where he is wrong however, is to assign a technological solution to these concerns,” says Warren. It’s a good point. Futurologists tend to overthink the solution and assume a ‘Hollywood’ vision of the future, where films such as Blade Runner, Minority Report, iRobot and now Ex Machina repeatedly resonate. We get lost in the science fiction and forget the realities of everyday life, and perhaps even the fact that we have the power to change it. Sometimes it is the everyday practical solutions that feed this change. For Professor Kevin Warwick, Deputy Vice-Chancellor (Research) at Coventry University and previously Professor of Cybernetics at The University of Reading, both in the UK, changing this situation is his life’s work. A pioneering expert in cybernetics, he has spent the last 20 years investigating the direct interaction of computer technology on the human nervous system, working with medical professionals to determine technological solutions for human conditions such as Parkinson’s disease. 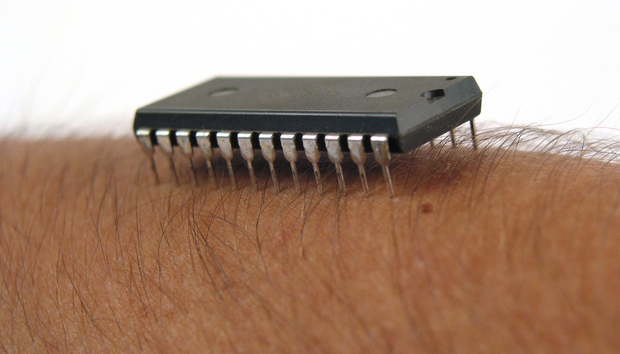 Warwick is famous for being one of the first people to have an RFID chip inserted under his skin to open doors and switch on lights, extending his work, through Project Cyborg, to include a 100-electrode chip implanted into the nerve fibres of his arm in 2002 that transmitted signals from his wrist to a computer. RFID, for radio frequency identification, is widely used to tag the movement of goods. There’s a challenge. At least Warwick’s practised his own medicine. The practicality behind his own research and development speaks volumes. Warwick is genuine and clearly concerned about the rapid development of AI and the predictions around singularity. To be fair, Musk has probably too busy trying to get into space and have autonomous cars running on our roads, but Warwick has a point. If Musk and Kurzweil keep banging on about this, surely there comes a point at which they have to take a practical lead, to add credibility to their commentary. Futurology, after all, is not an exact science (even though some futurologists would think otherwise) and it rests on plausibility and practical implementation. If you do something about it and learn from the experience, there is more credence given to the prediction. For Warren, it is the practicality that remains a concern. Human nature will, he suggests, not give in easily to the idea that technology will be the solution. Becoming a Cyborg, is, he says, “a short-term solution,” and one that doesn’t fit with the cycle of history. Perhaps this is where the idea of a societal divide will manifest itself. The transhumanists argue that history has no markers for what is to come. “Once we have been augmented through neural laces and mechanical alterations, a whole new wave on social and cultural concerns will be laid before us,” says Warren. For those that believe in the Cyborg future this may be irrelevant as they believe humans and human fears and emotions will be irrelevant, at least in terms of today’s parameters. Warren suggests that Musk’s answer to all of this will be a technology one. “While this mindset is guaranteed to result in greater efficiency, productivity and growth, it is not a view that supports a stable and rewarding society in the long term,” says Warren. “If humanity is to ‘stay relevant’ then technologists, businesses and politicians must drastically rethink the way that they approach socially disruptive technologies. The solution is not to change humanity to better fit technology, but to change technology to better fit humanity." In his recent paper, Homo Technologicus: Threat of Opportunity?, Professor Warwick digs deep into the practical and ethical questions of human-machine interaction. He suggests that “standing still is not an option” and that it’s not a matter of ‘if’ but ‘when’ we accept change. It boils down to who has control of the machines. The Cyborgs, it appears, could inherit the earth and the rest of us can do nothing about it.